The importance of pollinators – such as bees, butterflies, moths, and hummingbirds – is becoming more widely known. Bees pollinate approximately 35 percent of the food we eat. Pollinators as a whole are worth about $15 billion to the agricultural industry. Honey bees are important, yet they are declining. Besides issues such as habitat loss and disease, pest management methods can also contribute to population loss. Pesticides used to kill insects, plant pathogens and weeds can leave residues that kill bees and other natural enemies. Residues can linger in pollen and nectar, and pollinators moving into an area after an application can be unintentionally harmed. Even some less-toxic materials can be harmful if not applied correctly or if applied at the wrong time. 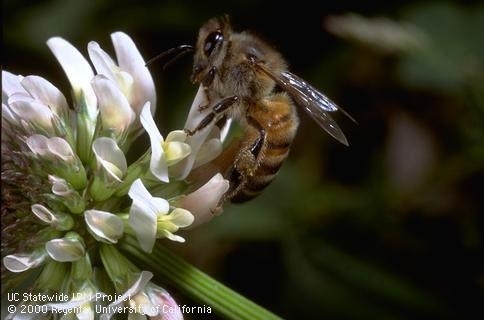 Growers and home gardeners can find newly updated guidelines for protecting pollinators as well as a list of honey bee resources on the UC Statewide Integrated Pest Management (IPM) Program website. The UC IPM program, a part of UC Agriculture and Natural Resources, works with residents, farmers, land managers, community leaders and other professional pest managers to prevent and solve pest problems with the least unintended impacts on people, beneficial species and their surroundings. IPM combines several effective pest control methods that are safe for people and the environment with the goal of long-term prevention and management. Many pest problems can be solved without the use of pesticides. Using pest resistant or competitive plants, removing the pests' sources of food and water, knocking pests off plants with a spray of water, deploying traps and blocking pests' entrance to buildings with screens or other barriers are just a few things you can do to reduce a pest problem. IPM reduces the need for pesticides, thus preventing harm to bees. Use them sparingly, and only treat areas where pests are problems. Choose selective pesticides and ones that won't persist in the environment. Time applications so that you are not spraying when bees are active, and avoid spraying during bloom time. Be aware of nearby bee colonies, and avoid spraying around healthy bee populations and areas with a lot of nectar-producing plants. New research looking at pesticide risks to honey bees and new pesticide labels being developed by the EPA that prohibit the use of some pesticides when bees are present are just a couple of efforts being made to protect pollinators. UC IPM is revising its list of pesticides ranked for risk of harm to honey bees in its Pest Management Guidelines (relative toxicities tables). An online searchable database is expected to be published in early fall. This information will eventually be incorporated into the Pest Management Guidelines. For more information on IPM and on what you can do to protect bees and other pollinators, visit the UC IPM web site.